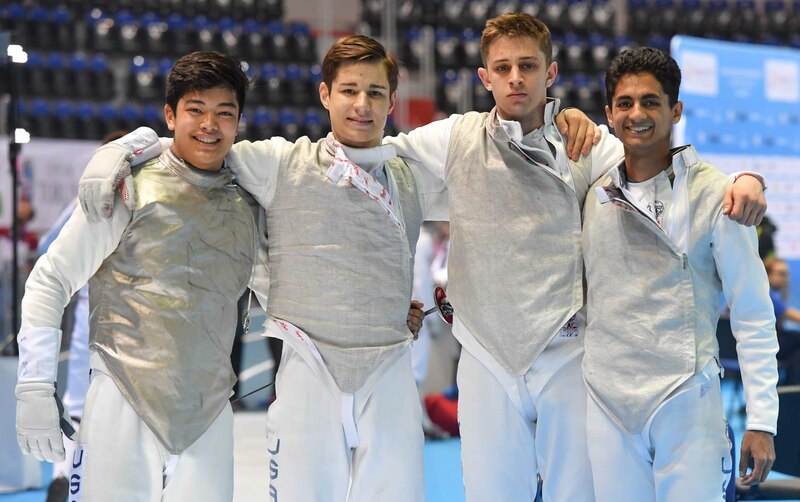 (Torun, Poland) – In a day of comeback wins, the U.S. Men’s Foil Team was unable produce the final victory it would need to secure a medal at the Junior World Championships on Thursday. The defending Junior World bronze medalists had cruised through the table of 32 with a 45-7 win over Kuwait to advance to the table of 16 against a Korean team that stayed within two of the Americans for most of the match. With a 35-33 lead to protect, two-time Junior World team medalist and Harvard sophomore Geoffrey Tourette (Cupertino, Calif.) went 5-3 against Gyeongmu Kim to bump the score to 40-36 going into the final bout. The 2018 Junior World Champion in the individual event, Nick Itkin (Los Angeles, Calif.) finished the match with a 5-1 win over Hyunmin Choi for a 40-37 victory. In the quarter-finals, Japan led the match, 20-14, after the fourth before Team USA mounted a comeback, outscoring Japan, 31-14, in the next five bouts. Itkin, a Notre Dame sophomore, won the fifth, 10-3, against Julian Gottschalk to give Team USA a one-touch lead at 24-23. Tourette, Itkin and 2018 Cadet World Champion Kenji Bravo (San Francisco, Calif.) then combined to take the next four bouts with Itkin anchoring the squad to a 45-34 win. Team USA led Russia for the first four bouts of the semifinals, ending the fourth at 20-19 before Russia won the next four bouts with Itkin, Tourette and Bravo each posting losses. By the end of the eighth, Russia had created a nearly insurmountable lead at 40-26. In the ninth Itkin fenced Kirill Borodachev, this year’s individual Junior World Champion, and outtouched his opponent, 6-5, but wasn’t able to make up the difference as Russia won the match, 45-32, and won to earn gold for the second straight year. In the bronze medal final against Italy, Itkin, Tourette, Bravo and 2018 Cadet World silver medalist Marcello Olivares (Cooper City, Fla.) each fenced in the match, but the Americans couldn’t hold off Tommaso Marini. At just 18 years old, the 2018 Junior World silver medalist is already ranked among the top 30 seniors in the world after winning silver last month at the Absolute Fencing Gear® FIE Grand Prix Anaheim. Marini scored 32 of Italy’s 45 touches to defeat Team USA, 45-40. In the women’s event, Team USA returned all four members of the squad that won gold in 2018: Sylvie Binder (Armonk, N.Y.), May Tieu (Belle Mead, N.J.), Delphine DeVore (Westport, Conn.) and Lauren Scruggs (Ozone Park, N.Y.) who was competing for a third straight day after winning both the individual Junior and Cadet World titles. Team USA opened with a table of 16 match against Czech Republic where all four fencers competed with Binder, Tieu and Scruggs each contributing a 5-0 shutout to the 45-10 tally. In the quarter-finals, Team USA fenced a Japanese team that included Yuka Ueno – the 2018 Junior and Cadet World Champion who won bronze after a loss to Scruggs on Wednesday – as well as Algiers Senior World Cup silver medalist Sera Azuma and Cairo Senior World Cup medalist Sumire Tsuji. Team USA led the match, 18-7, after the first four bouts, but Japan brought it back to a tie at 35 after the eighth. In the final bout, Scruggs came in as anchor against Ueno with 10 touches up for grabs. Ueno was set to avenge her individual loss, however, and clinched the win for Japan, 43-39. The Americans struggled to find a rhythm in the next match against Canada with DeVore and Tieu contributing one bout win each with Canada taking the remaining six. Binder returned to the anchor role, but Jessica Zi Jia Guo finished the match for Canada with a 45-33 victory. Binder, DeVore and Tieu combined for six won or tied bouts against Germany in the first eight rounds to lead the match, 39-34. In the final bout of her junior career, Columbia sophomore Binder shut out Sophia Werner, 6-0, to finish the day with a 45-34 win for seventh place. On Friday, the men’s and women’s epee events will begin with individual junior competition.